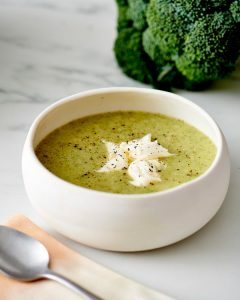 Its the season for soups.. try this delicious pulpy and cheesy broccoli soup! Arrange a rack in the middle of the oven and heat to 450°F. Heat 1 tablespoon of the oil in a large pot over medium heat until shimmering. Add the onion and cook, stirring occasionally, until soft, about 5 minutes. Meanwhile, peel and chop the potato into 1-inch chunks. Add the broth or water and potato to the pot and bring to a boil. Spread the broccoli out onto 2 baking pans. Drizzle the remaining 1 tablespoon of oil over the broccoli, sprinkle with a big pinch of salt and pepper, and roast for 5 minutes. Stir the broccoli and return to the oven for 5 minutes more. Once the soup is boiling, add the broccoli and return to a boil. Reduce the heat as needed and simmer until the vegetables are tender when pierced with a fork, 5 to 7 minutes. Remove from the heat. Purée soup in a blender. Add the cheese and stir until melted. Taste and season with salt and pepper as needed. Serve topped with a small dollop of fresh cream, or a squeeze of lemon.